A 24th round draft pick of the Bills (12th round by Green Bay in the NFL draft), Lamonica backed up Jack Kemp in Buffalo for his first four seasons. Often used in relief of Kemp, he was effective but became restless in the backup role and was traded to Oakland for the 1967 season. He was also mobile and led AFL quarterbacks with 289 rushing yards in 1964. Given the opportunity to start, and with a strong arm and affinity for going deep, he proved to be an excellent fit in Oakland’s vertical passing game. Lamonica passed for 3228 yards and 30 touchdowns as he received AFL Player of the Year recognition for the first time and the Raiders won the league title. “The Mad Bomber” followed up in 1968 by passing for 3245 yards and 25 TD passes, and won a memorable duel against Joe Namath and the Jets in the so-called “Heidi Game”. The team went 12-2 and advanced to the AFL title game but lost in the rematch with New York. Raiders went 12-1-1 to finish first in the AFL Western Division while leading the league in total yards (5036), passing yards (3271), scoring (377 points), and touchdowns (45). Won AFL Divisional playoff over Houston Oilers (56-7). Lost AFL Championship to Kansas City Chiefs (17-7). With the AFL/NFL merger in 1970, Lamonica was selected to the Pro Bowl but his numbers were in decline and injuries were becoming a factor. 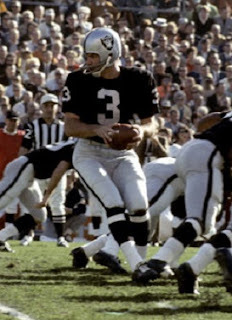 Following one more Pro Bowl selection in ’72, he lost his starting job to Ken Stabler in 1973 and, after throwing just 9 passes in ’74, played out his option and signed with the Southern California Sun of the WFL. A preseason injury knocked him out of action and he backed up rookie Pat Haden, completing just 9 of 19 passes for 90 yards with a TD and three interceptions before the league folded and his career came to an end. Overall, in the AFL and NFL he passed for 19,154 yards with 164 TDs and 138 interceptions and had a 66-16-6 regular season record as a starting quarterback (4-5 in the postseason).